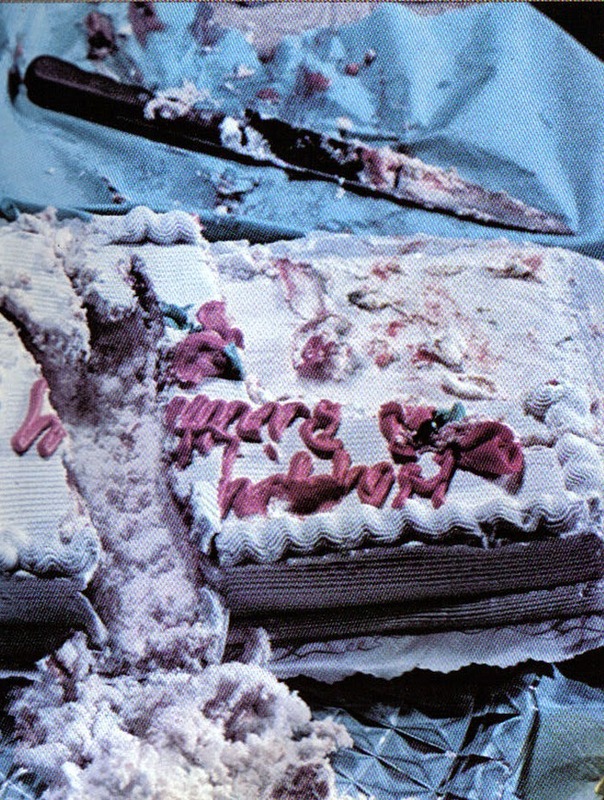 If you were to believe the horror media, only one horror masterpiece is celebrating its 40th anniversary this month – THE TEXAS CHAINSAW MASSACRE (1974). 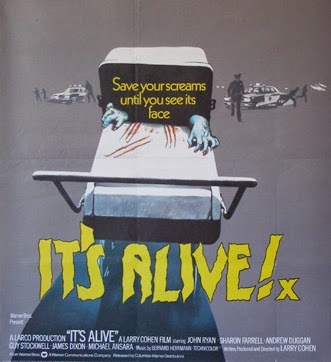 However, another film also came out this month forty years ago and experienced a much more painful birth before its eventual classic status – Larry Cohen’s iconic IT’S ALIVE first hit theaters forty years ago today on October 18, 1974. Unlike Tobe Hooper’s unnerving film which found instant success, Cohen’s mutant baby epic had a rather difficult delivery that saw the filmmaker claw and scratch as much as his lead killer kid for years in an effort to give his first horror effort as a director a right to live. According to Cohen on the film’s DVD commentary, IT’S ALIVE was born from wondering what a tantrum-throwing baby could do with power combined with the idea of parents being terrified of their children in the wake of the ‘60s counterculture. With the go ahead from Warner Bros. on his script, the director maintained an insane pace while shooting the film in September/October 1973. Cohen would shoot Monday through Friday on this film and then use Saturday and Sunday to finish shooting HELL UP IN HARLEM (1973), the sequel to his hit BLACK CAESAR (1973) starring Fred Williamson. Unfortunately, by the time Cohen finished his horror film, he found the regime that had greenlit it at Warner Bros. had been replaced. Rather than judge the film on its own merit, the new execs took the all-too-common Hollywood approach of disregarding any property their predecessor had backed. 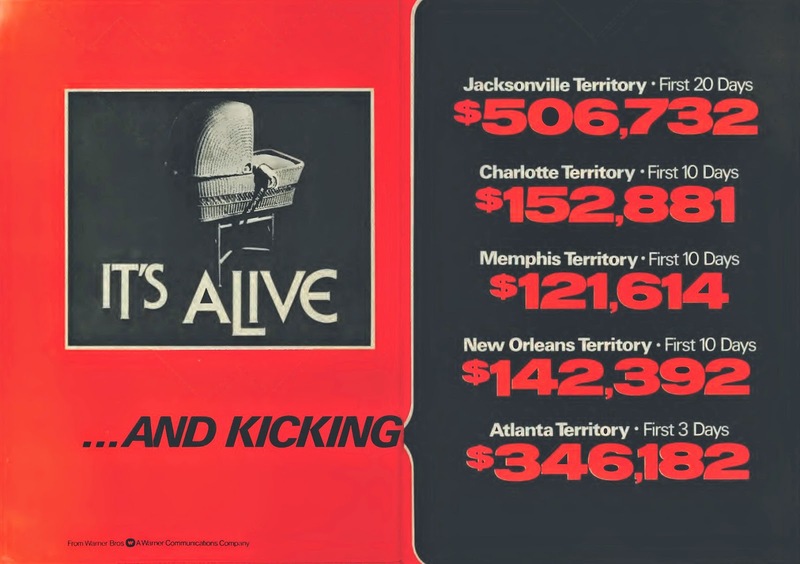 This resulted in IT’S ALIVE getting a one theater play date with a rather unimaginative ad campaign sporting the “Whatever it is…It’s Alive” tagline. 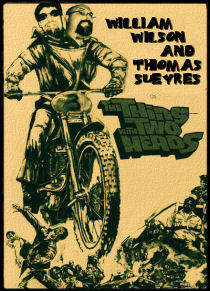 The company opened the film at the Woods Theatre in Chicago, Illinois, where it did very respectable business. This actually happened earlier in 1974, before the “official” October 1974 release date. 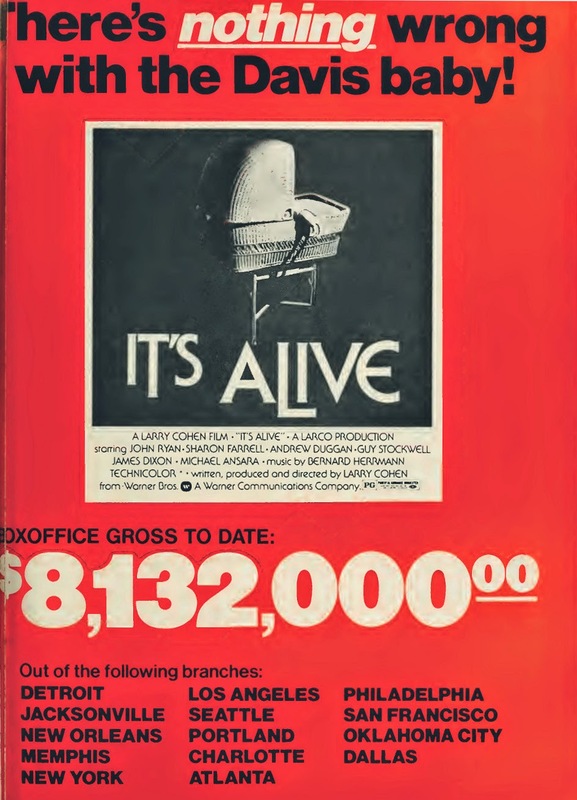 Figures reported in Variety were very good (“IT’S ALIVE is bowing to a good $22,000” – May 1, 1974; “IT’S ALIVE is an okay $21,000 in a fourth Woods whirl” – May 22, 1974). The fact that it was grossing just one thousand dollars less than its debut four weeks earlier at just one theater is pretty impressive. But not impressive enough for the Warner execs, who penciled it in for a limited rather than national roll out in the fall on October 18, 1974. Interestingly, a full-page ad was placed in Variety’s December 4, 1974 issue touting the film’s regional successes at the box office (figures shown include $175,370 in Los Angeles and $219,480 in Chicago), but the powers that be still refused to get 100% behind the picture. 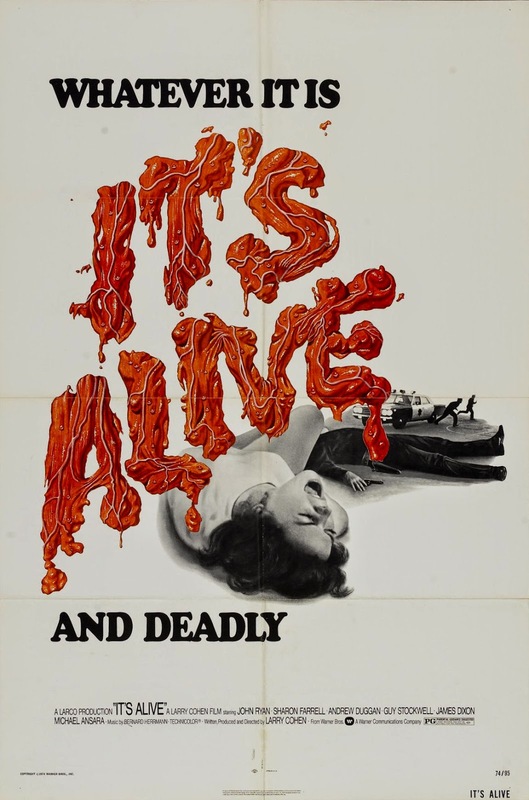 IT’S ALIVE played well into 1975 – it was still charting in October of that year with co-feature BLACK CHRISTMAS (1974) – but never achieved the kind of mainstream success Cohen felt the film was capable of. Ever the workaholic, Cohen put the film behind him briefly as he subsequently wrote and directed GOD TOLD ME TO (1976) and THE PRIVATE FILES OF J. EDGAR HOOVER (1977). 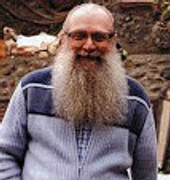 Cohen’s distance from the film, however, was short lived and when he found out that another regime change had taken place at Warner Bros. in 1976, he implored the new guys charge to review the film. Like the aggrieved father in IT’S ALIVE played by John P. Ryan, Cohen fought for his baby to have the life it truly deserved. After enthusiastic screenings (with one exec calling it the “scariest motion picture he’d ever seen”), Warner Bros. Executive VP and General Sales Manager Terry Semel decided to reissue the flick in the spring of 1977 with hundreds of prints and a national roll out, despite this cinematic toddler being over two years old. Cohen’s baby also got prettied up with a brand new ad campaign that understood and conveyed the picture better. 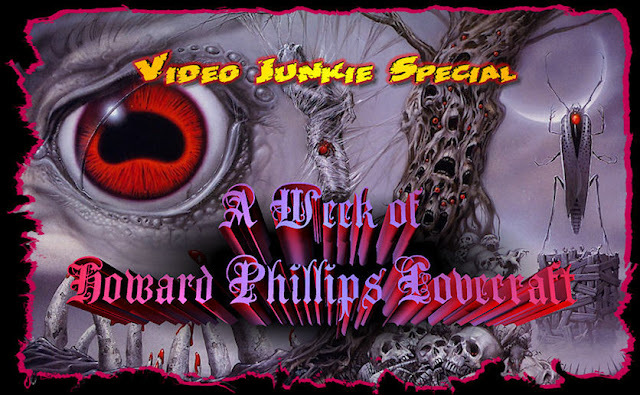 With the tagline “There’s only one thing wrong with the Davis baby…It’s Alive” and a memorable TV spot with the iconic baby carriage/claw imagery, the film soon became the stuff of horror legend and thrilled audiences anew when it unreeled in March 1977. Imagine that today – a film nearly two and a half years old getting re-released and raking in the cash. The studio had no qualms about the success this time around as they began filling trade papers with ads touting the film’s box office success. 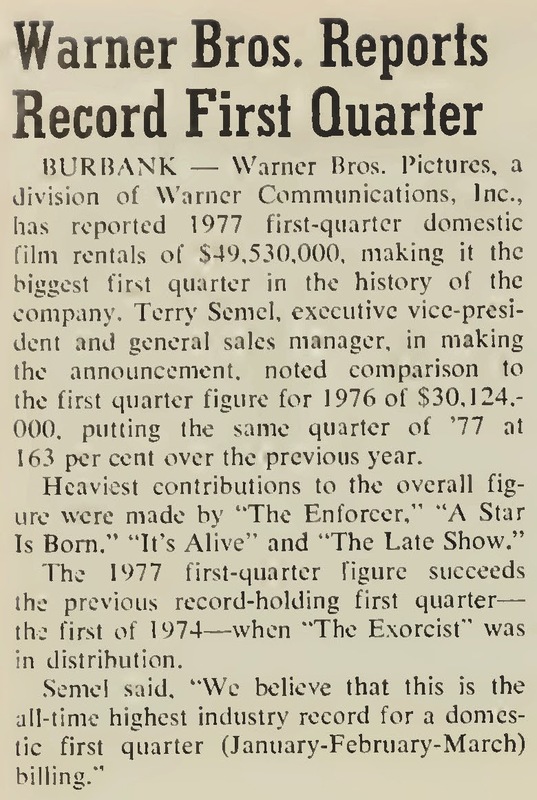 Semel went so far as to credit the film as one of the contributing factors in Warner’s great first quarter in 1977. Cohen’s confidence in the picture was finally reaffirmed and he soon found himself a wealthy man due to the project. He also soon found the studio that wanted to abort his baby begging him for a sequel, which he delivered the following year in IT LIVES AGAIN (1978). He finished off the trilogy almost a decade later with IT’S ALIVE 3: ISLAND OF THE ALIVE (1987) and co-wrote the eventual remake IT’S ALIVE (2008). 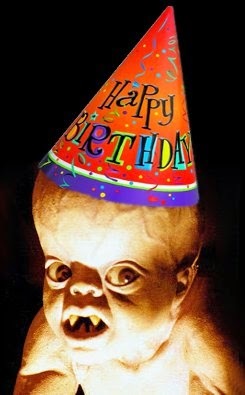 So let’s all wish happy birthday to the Davis baby. 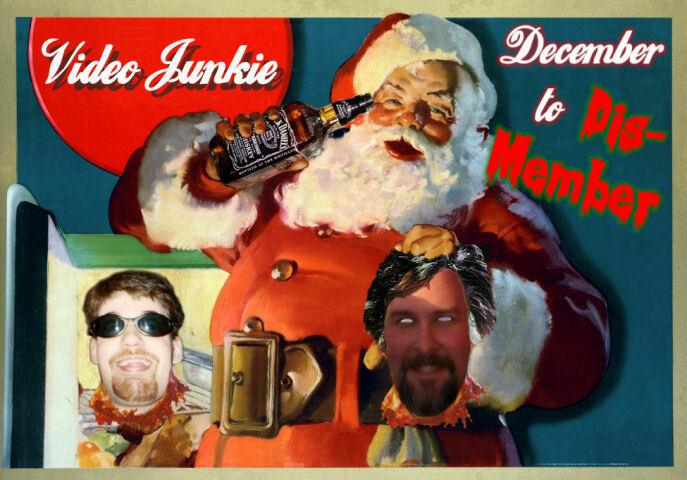 Now let’s celebrate and have some cake…oh, junior!